Why Store Rainwater for Later Use? Perhaps a better question is, why waste the rain? It’s easy to automatically collect and save rainwater so that it can be used during dry spells on gardens, shrubs, trees, lawns, or for other everyday water needs. Don’t pay for city water to water your garden or lawn. 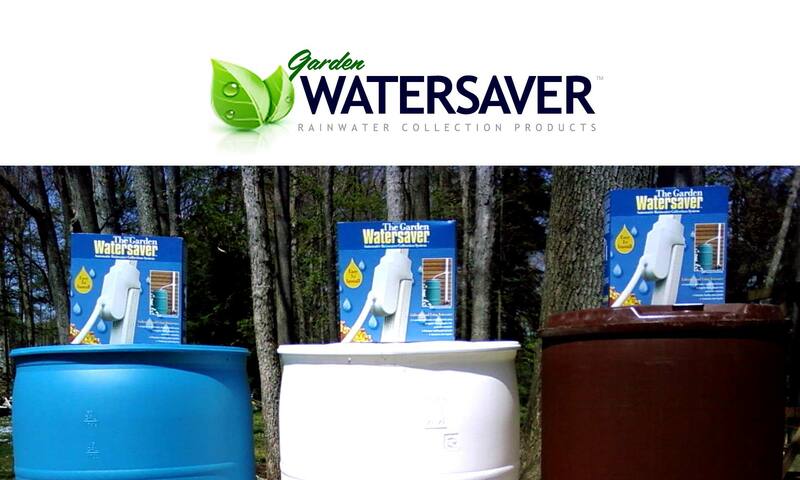 Set up a rain barrel system using the Garden Watersaver Downspout Diverter to collect the rain and use it later, whenever rainfall becomes less frequent and plants and flowers ‘need a drink’. In the photo example shown here (which holds 112 gallons or 425 liters! ), the homeowner uses the trash can as a third container to accumulate additional rainwater. During hanging-basket season, she adds a small amount of fertilizer (kelp, fish or other types that dissolve in water) to the trashcan to replenish the nutrients in her flower baskets whenever she waters. Additional containers may be added and filled by inter-connecting the containers using a Barrel Connector Kit. That way, a person can store as much water for later use as hits their roof! No need for unattractive rain barrels that have to sit directly under the downspout, either. With the diverter, rain barrels can be moved out of sight to a low-visibility area of the yard — or even inside a shed! Create a no-hassle rain barrel water collection system to store rainwater for future use, and you’ll have easy access to free water whenever you need it!